One of the offices I worked in back in our Birmingham days was on the daily fax list of a local meat & three lunch establishment, which meant we got their specials every day with a very convenient order form on the bottom that all you had to do was fill out and fax back to place your lunch order. Thursdays were Banana Pudding Day (also squash casserole day and don’t ask me how I remember either fact). It was the kind that was made from scratch, with Nilla Wafers and real bananas. I came into work one day to find on my desk a note from this very sweet older woman I worked with. 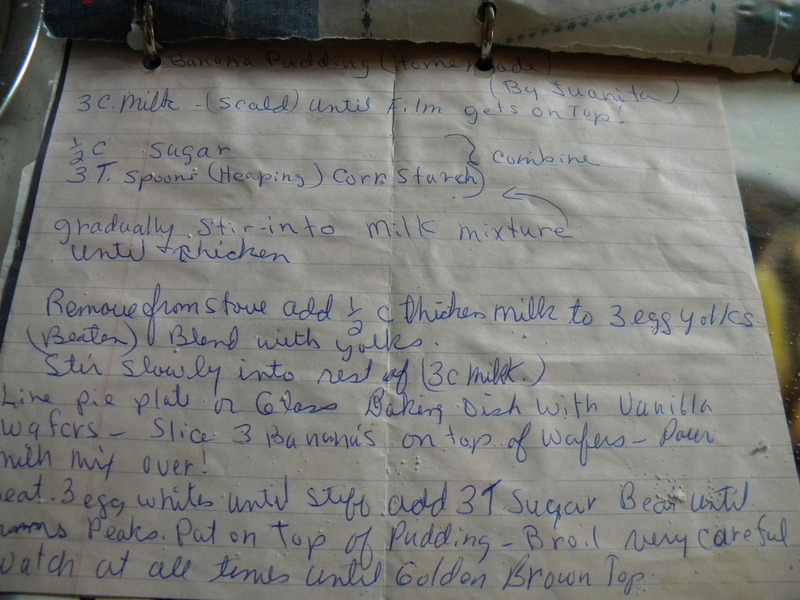 It contained her recipe for Banana Pudding, that she swore was better than Joel’s (the name of the restaurant). I was skeptical, but she assured me that whipping the egg whites was a great use for the KitchenAid stand mixer my boyfriend had recently given me, hoping to encourage me to learn to bake. She assured me, this was a recipe he’d appreciate me learning to make. 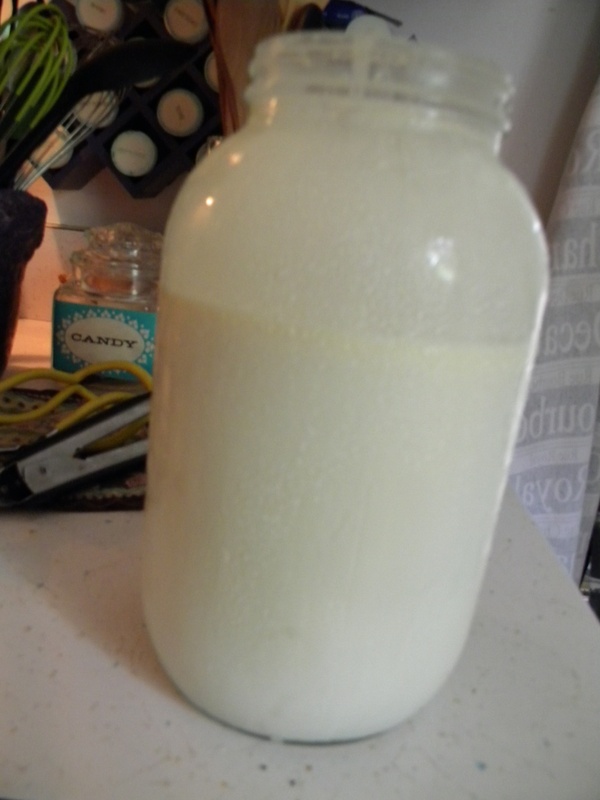 I found myself with a half gallon of raw milk Saturday. I was told it was a few days old and that cooking with it would be best. And immediately, the idea of banana pudding popped into my head. Just as quickly, Pat offered to run up to Reid’s for anything else that was needed to make this idea happen. 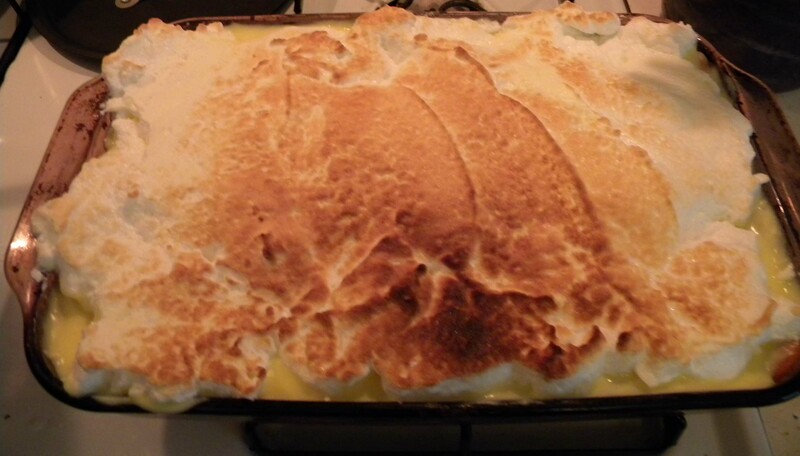 He loves banana pudding and this recipe? Pat’s seventy-something father has said it’s just like the banana pudding his mother made when he was boy. It’s the real deal. Juanita was right when she said my boyfriend would appreciate this pudding recipe. Even though he’s now my husband, he still appreciates it. If you’ve never made your own pudding before, this is the one to start with. It’s the banana pudding your grandmother made. Or your grandmother-in-law as the case may be. Line pie plate or glass baking dish with Vanilla wafers. Slice 3 bananas (or more) on top of waters. Scald 3 cups milk until a film appears on the top. Beat 3 egg yolks and set aside. Set 3 egg whites aside. Combine 1/2 cup sugar with 3 heaping Tablespoons corn starch. Pour some of your hot milk into the sugar/cornstarch mix until smooth, then whisk the mixture into your milk, stirring until thickened. Pour 1/2 cup of the milk mix into the egg yolks. Blend, then slowly stir into the rest of the milk mixture. 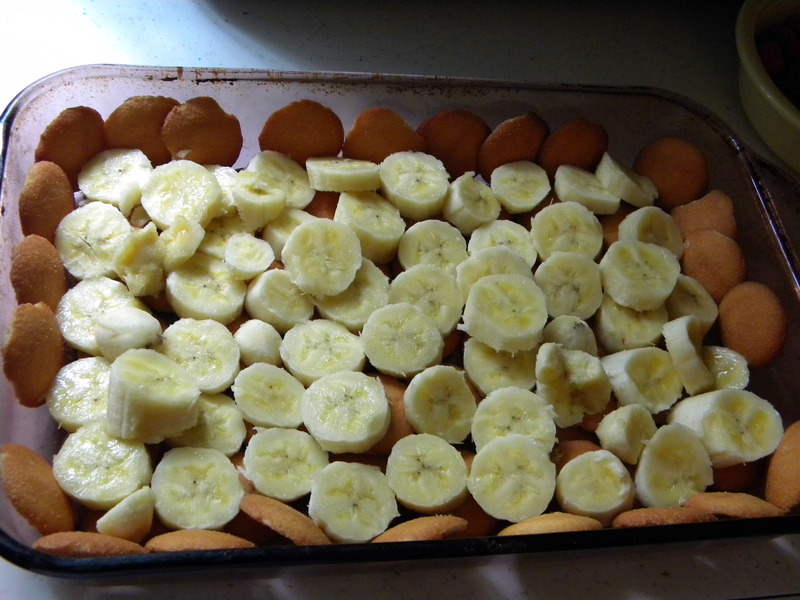 Pour mixture over your wafers & bananas. Beat 3 egg whites until stiff. Add 3 Tablespoons sugar and beat until stiff peaks form. 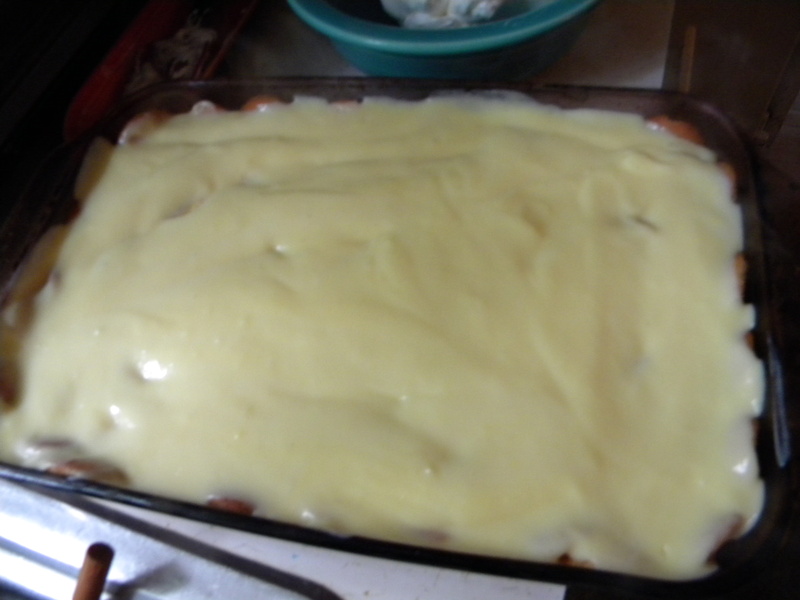 Spread on top of pudding and carefully broil until golden brown on top. Oh my god, that looks divine!! Two servings a day divine! I haven’t had banana pudding in ages! We hadn’t either. It’s sooooo good if I do say so myself! Your Uncle Jack swears it’s just like his mother’s. As does your cousin Pat. And even if it’s not, it comes pretty darn close. OMG, do you mean Tracy’s??? I’m so sad they are gone. We used to eat there frequently when at UAB. Oops, I read further and realized that it’s a different restaurant. I got so excxited that I commented before reading the whole post. Sorry! That’s the beauty of the meat & threes, esp. in Birmingham – they are all good home cooking! This dessert is really hard to beat, and one of my favorites also. My mother has a damn good recipe for the same (which, fortunately, she still uses), and I can’t wait to compare the two. Thanks for sharing! I’d eat it until I saw the bottom of the plate. Oh, bananas and pudding! I made a double batch and it did not last two days in this house. Good stuff.